The sun that had earlier kissed the slopes had progressively disappeared under the heavy clouds. Gradually chilly it had turned. It seemed like the afternoon rains which are very common in the Kenyan highlands would pour anytime. At a corner, where two houses join, a lady sits on a stool, taking in scenery and enjoying the breeze. Donning several sweaters, a maroon dress, a blue woolen cap which covers her white hair and she has a walking stick at her side. Upon sighting her visitor, she bursts out laughing. “My husband, is that you or are my eyes deceiving me?” she exclaims. A hearty handshake ensues accompanied with the rhythmic vocal intonations. She may not do it herself due to vagaries of age but just like a wife would, she asks Wairimu, her helper to get her husband a stool, take his bag and warm up a mug of uji for him. Wairimu, does all this in short order. She also introduces herself to the husband as a distant relative. Wife and husband then proceed to catch up on ‘home’ matters. With each finding out what the other had been up to since they were last together. Conversation drifts leisurely as the husband sips his uji. “Is it too hot? Should Wairimu bring another cup to aid you cool it?” wife soothingly asks husband. During a lull in conversation, a cow moos at a distance. A cockerel chases two hens around the homestead. The dog, Tiger, sniffs out the visitor and attempts to play. For its efforts it earns itself a poke with the walking stick. Wairimu washes the dishes, begins preparing the evening meal and lights up the jiko. Husband picks up the thread of conversation. He guides it to an area that had previously just been glossed over. Wife lights up like a Christmas tree. Making light work of the many decades that have passed by. Her memory razor-sharp. When I first went to Nairobi, we lived in Majengo. This was in the late 1950s. I moved to be close to my husband. By then I had three children with the then last-born just a couple of months old. My friends in Majengo were Khadija and Fatuma. Swahili women who loved talking and cooking. They greatly improved my Kiswahili. Unfortunately once I left Nairobi, I forgot most of it. One day a white man did allocations for houses in Bahati – a newly-constructed estate for Africans. Three families were to share one house. It was a big leap from living in Majengo. With the many constructions in Nairobi I cannot point out where the house stands now. To eke out a living I sold vegetables in Marikiti Market. A group of us women would harvest vegetables from the banks of Nairobi River after paying for strips. The farmers were from Embu and Ndia. I do not know if they owned the land or just farmed it. We picked the vegetables during the day, washed them until they looked very fresh, and then took them to the market at 3am. There were matatus to town. I would sell my stock and still come back and prepare breakfast for my school-going children. My clientele at the market were mostly Asians although there was a sprinkling of white ladies. I struck up a friendship with two Asian ladies. One did not have kids. One did. She invited me to an Indian wedding. It was a great chance to sell my wares and experience the eight day ceremony. By now I had gotten more children. I was also taking care of my nieces and nephews as well as other family’s children. To further supplement the family income I brewed flour-based African beer. I bought the flour from my Majengo friends. Sympathetic to my large brood, the alcohol consumers made a beeline to my house every evening to partake of my brew. I sold a quart at one shilling and a pint at fifty cents. The shadow of the white man was never far off. Several encounters spring to mind. 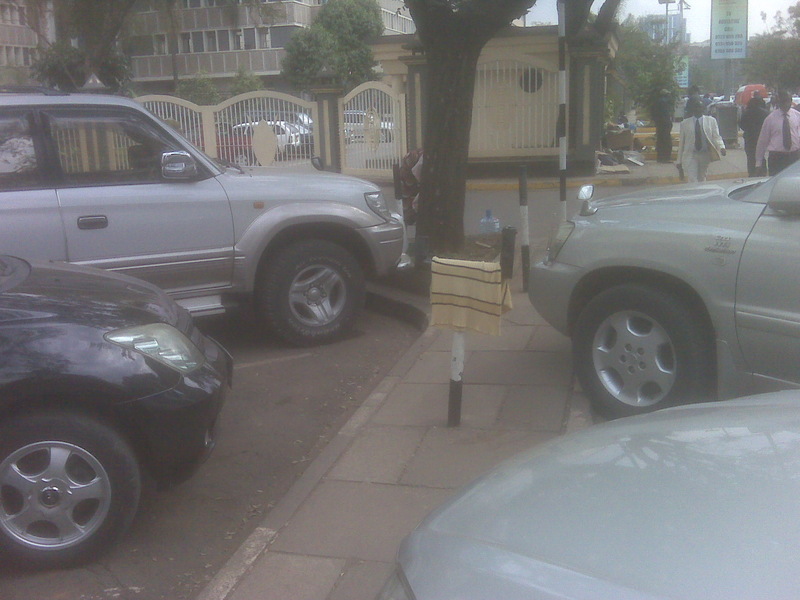 Once I had to stand in an identification line as a betrayer picked out Mau Mau sympathizers. Off course I had taken the oath. The betrayer was fully covered. Only his eyes were visible. He did not speak. Just nodded or shook head to show who was Mau Mau. He did not pick me out. Another time was more risky. My husband ran a charcoal business. He kept guns for Mau Mau in the sacks. The authorities suspected but never found evidence. One day there was a swoop, he was taken to a police station and almost taken to jail but luckily he was not. The sight of me with a child several days old must have softened the cops’ hearts. Kenyatta, I cannot say I saw a lot of. Father of Odinga walked around Bahati a lot. He dressed in shorts and a Swahili cap. He seemed a brave man at ease with people. The Independence Day was quite something! It was at that big open piece of land. What do you call it? It rained a lot. Lights were switched off. Then upon their return the white man’s flag had been brought down and Kenyatta hoisted our flag. It was the end of the white man. We were very happy. The questions cease. Husband takes in the impromptu history lesson. Wife smiles and has a far-away look. She appears to be reminiscing. 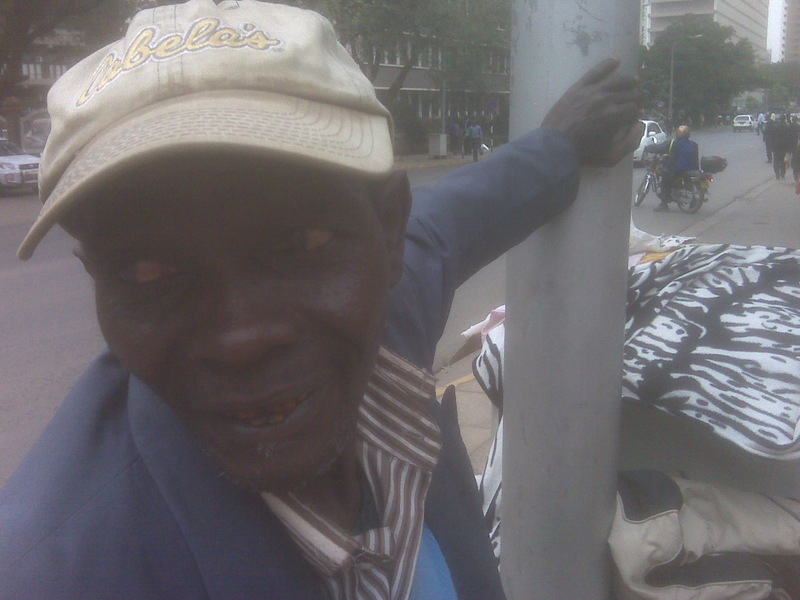 Husband is awed by how her memories tell a story of Kenya’s last 50-years. Husband is grandson. Wife is grandmother. Wife’s memories are her husband’s heritage. Wife’s memories are Kenya’s history. I was walking in town this afternoon when I stumbled on a sight that tugged my heart. 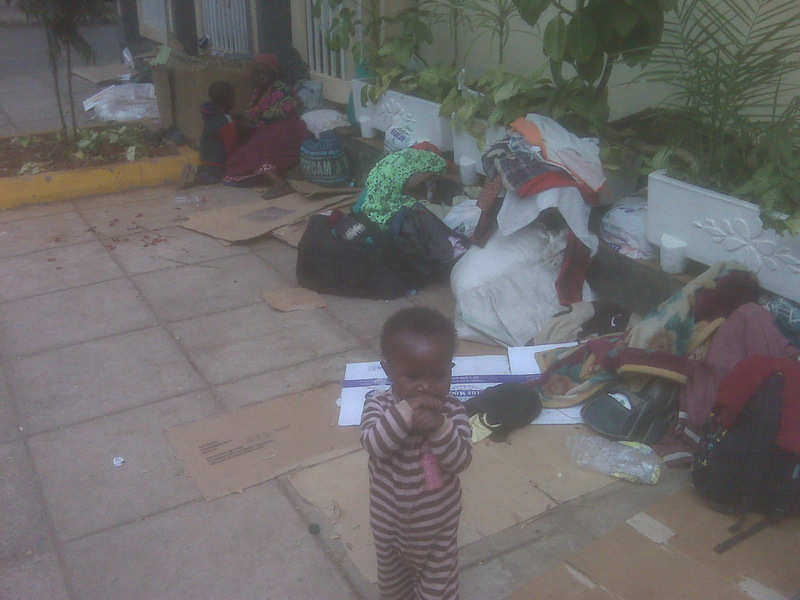 A group of IDPs from Mai Mahiu have been sleeping on Harambee Avenue outside the Prime Minister’s office and directly opposite the Office of the President since Thursday last week. They are seeking the fulfillment of a promise by the Ministry of Special Programmes to give them land. According to Nahashon Kamau of Vumilia Narok, they were promised two and a quarter acres of land but to-date the government has been playing hide and seek with them. There is also a dispute between them and the government over whether they should be given land “somewhere in Laikipia” or they should be given Sh500,000 (SH450,000 – land and Sh50,000 – planting) and purchase land where they chose. So far no government official has spoken to the IDPs who comprise of four different groups: Vumilia Narok, Vumilia Eldoret, Amani (Naivasha) and Maono Yetu (Nakuru). According to Beatrice Njeri from Vumilia Eldoret they are surviving on the goodness of well-wishers and will only leave Harambee Avenue when the government fulfills their promise. Mr. Nashon Kamau cuts a dejected figure peering into space as he contemplates his future. 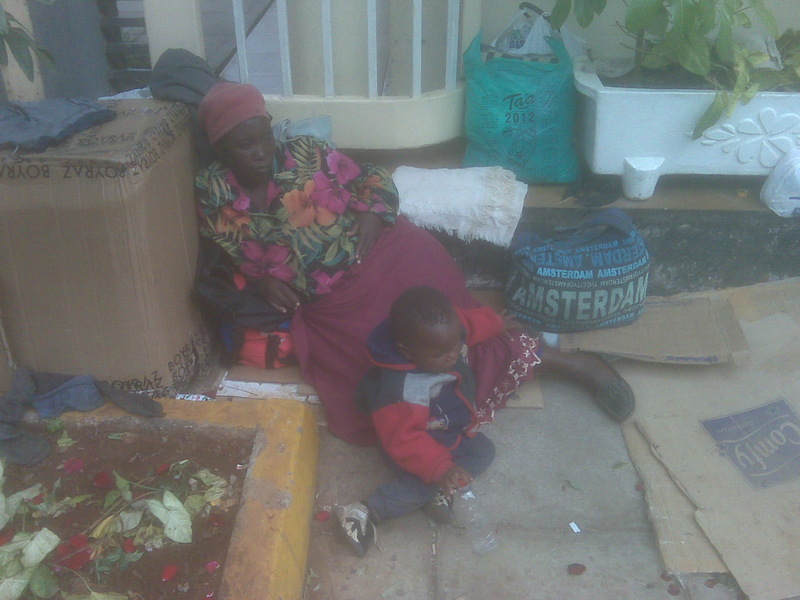 Ms. Beatrice Njeri with her son Ian. Baby Miriam Njeri playing on Harambee Avenue. 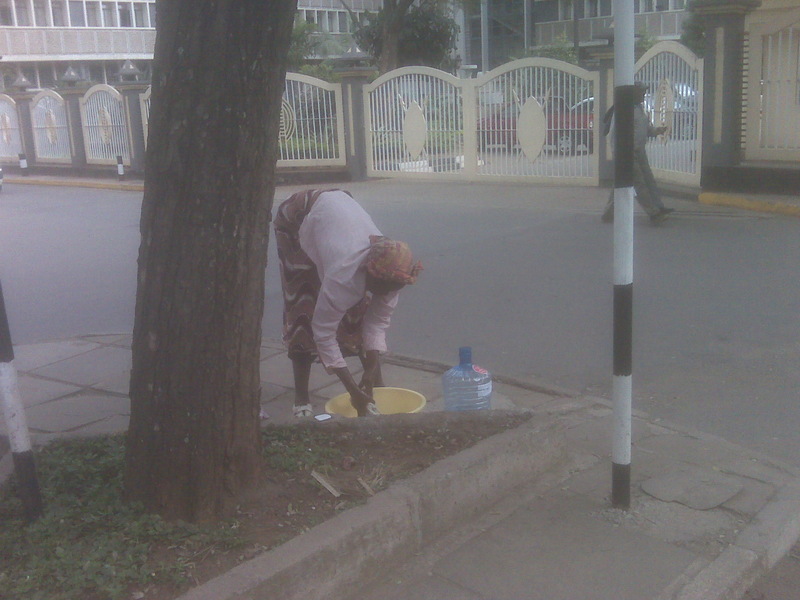 Njeri’s mum washes clothes on Harambee Avenue. Clothes hang on a disused parking meter on Harambee Avenue. 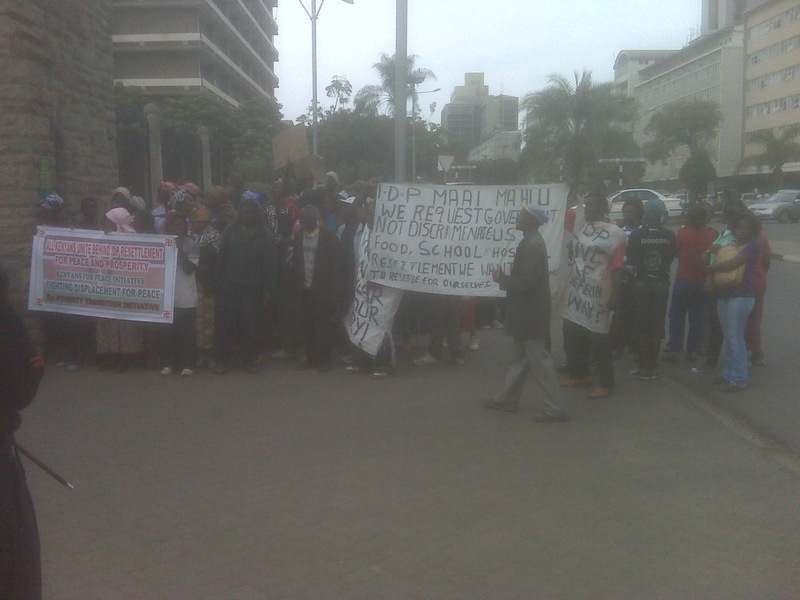 A section of the IDPs demonstrating outside Parliament. This on a day when the president opened the Sh980 million refurbished Parliament and incidentally the Prime Minister is in London to watch the closure of the London Olympics and meet investors. Never mind that the President spent a week in London watching the opening of the Olympics and meeting investors and was too busy to meet Kenyan athletes. UPDATE: As of today,(Friday) afternoon the families are no longer there. I hope that their prayers were answered.